In the wee hours of the morning, it must have been a sight to see a toddler riding a 5000-pound safe being pushed down the middle of Higuera Street. After opening their first downtown SLO location, The Najahe Inc. in the 1970s, Richard and Laurel Stephens were now expanding to their second location in the Barrett Block building across from Hanna’s Hardware on Garden Street. Little did they know at the time that Garden Street Goldsmiths was destined to become a multi-generational mainstay for more than the next four decades. 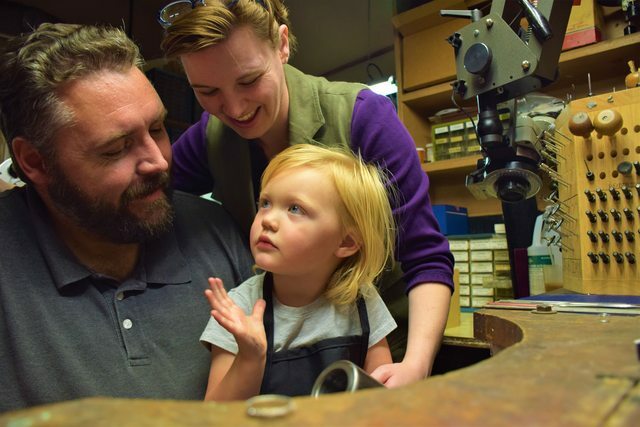 Richard and Laurel’s daughter, Amanda Stephens, had a natural talent and vision for the complex engineering and manufacture of heirloom quality jewelry. Being a designer and a bench jeweler herself, Amanda took the reins in 2000 and has been GSG’s leader ever since. Old school ethics, integrity, and environmentally sustainable manufacturing practices have been some of the cornerstone values of GSG’s business model since its inception. Amanda’s stewardship of her business is no different, she takes pride in finding or designing inventive ways to reuse or repurpose her client’s sentimental gems or jewelry. And, when the design calls for new materials, she will reach for recycled metals every time. It’s a family business. Amanda is the spear’s point, Richard, a co-owner, is still an integral member of the GSG team. 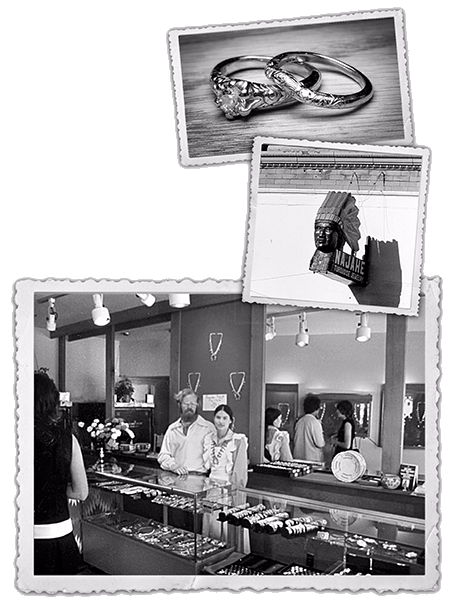 Amanda’s husband, David Hillebrecht, has always enjoyed carving and sculpting and has now become one of GSG’s top jewelry designers. Finnegan the beagle, their senior jewelry ambassador, is ready to greet you at the door. Samantha, Amanda and David’s daughter, comes to work most days and is growing up within the same four walls that Amanda herself did. While Sam works at evading her grandmother, many of our downtown locals enjoy a quick high five, or if lucky a big hug, when they stop in for a new addition to their jewelry family.